ERIC BRUNS WAS named the superintendent of Woodland Cemetery a few months ago, and the grounds are looking really good. Eric is from around the Camp Point area and was once the superintendent of Arrowhead Heights Gold Course in Camp Point. It's nice to see Eric and his staff out on the grounds every day. Eric himself can be found trimming and mowing and doing all the dirty work. And the little things, like the edges of the grass by the road being trimmed and the brush and debris picked up right away, are getting done. 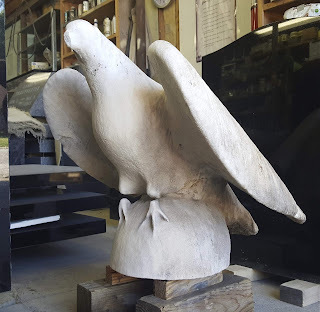 Damaged eagle of the Civil War Monument, now repaired. The Civil War Monument was recently restored and put back up after being damaged in the July 2015 storm. It looks great and it was a huge project that took many people to accomplish. There's been more traffic and people in the cemetery, too. It was designed in a Victorian park setting, so I'm glad people are discovering it. Personally, I'd rather it stay nice and quiet. Right when Eric started this Pokey Man craze was going on and there were a lot of people wandering around with their faces glued to their phone screens instead of taking in the historic setting, but fortunately that has died down. I believe there are going to be expanded Woodland tours in October, instead of just the one annual Nov. 1 tour, so keep your eyes open for that event.